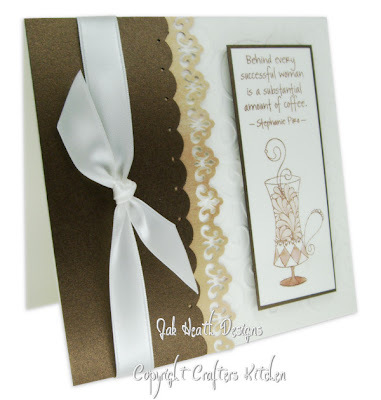 The stamped images are slear stamps by Impression Obsession called Smell the Coffee. Really lovely card. Just got my new cuttlebug - it is ace! jak~ I've been too sick this week to respond to your hands, but it is the one time I can say 'I feel your pain' and it's really true! Hope they are better, and you are not too frustrated at this point! Right or left, the cards are beautiful! I loved this card and the other before!! They are so elegant!! Congrats!! STUNNING !!! Love those colours. Stunning again Jak. I just love the simplicity of your designs. The colours are superb. Lovely card, Jak, beautiful colours. Beautiful Jak as always, love the colours and those punches are gorgeous, must have a look for them. Its beuatiful Jak love the look of those new punches. Stunning Jak, love the colour of it and your left hand is every bit as good as your right hand. Gorgeous.